Am I procrastinating working on the Tatami Room photostory or am I just excited about Brick Facade 2.0? As mentioned in the last post, the Dollshe Saint and Bernard are sculptural brothers, so I set out to make Brick Facade look like Tennyson’s brother. Looking at Brick side-by-side, I would say the change was subtle. 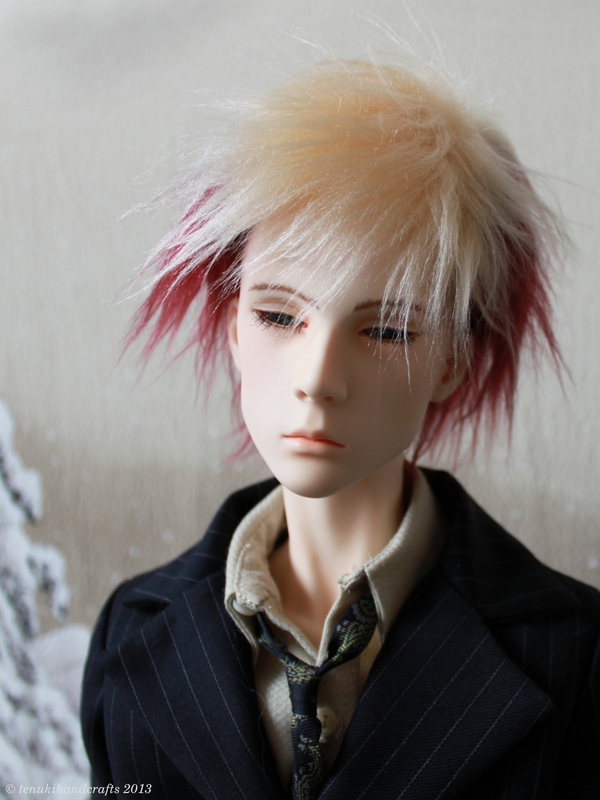 Darker eye brows and more depth to his eye area. 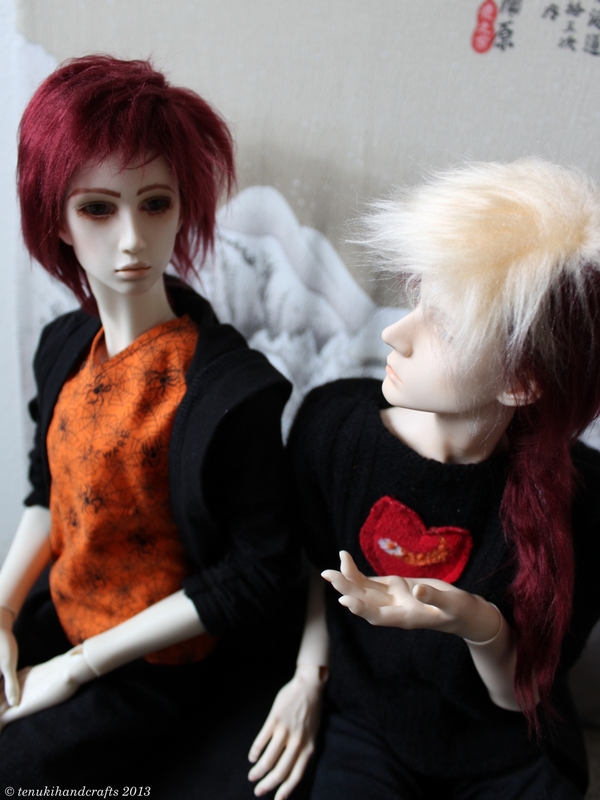 I made their wigs, using a free pattern from Antique Lilac for Tibetan fur wigs. Since they’re bros, I used the same fur, a blonde section and a long ponytail for Brick. 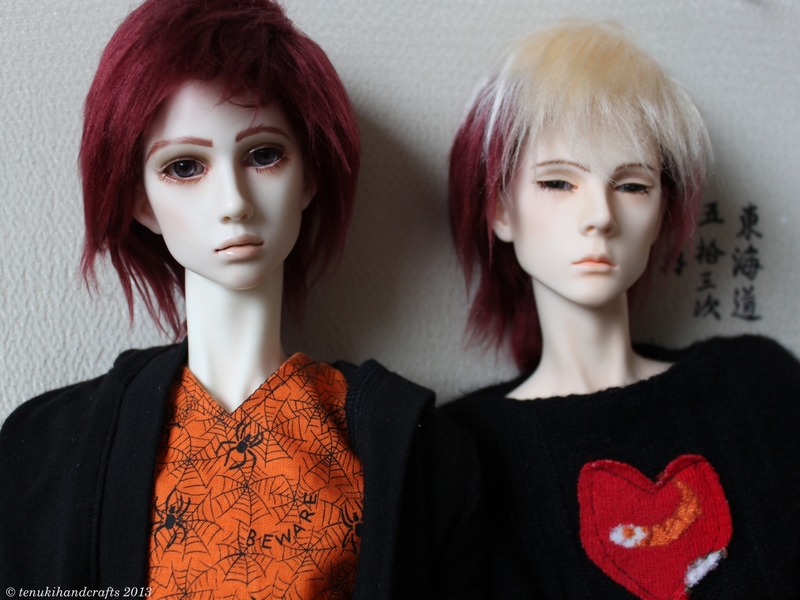 Both face-ups are by me, as are most of the clothing, except Tenny’s hoodie (unknown maker), Brick’s suit (Dollmore), shirt and tie (Dolls of Mine). Today was another lovely, partly cloudy, cold November day. I love the shadows I got on the lads. 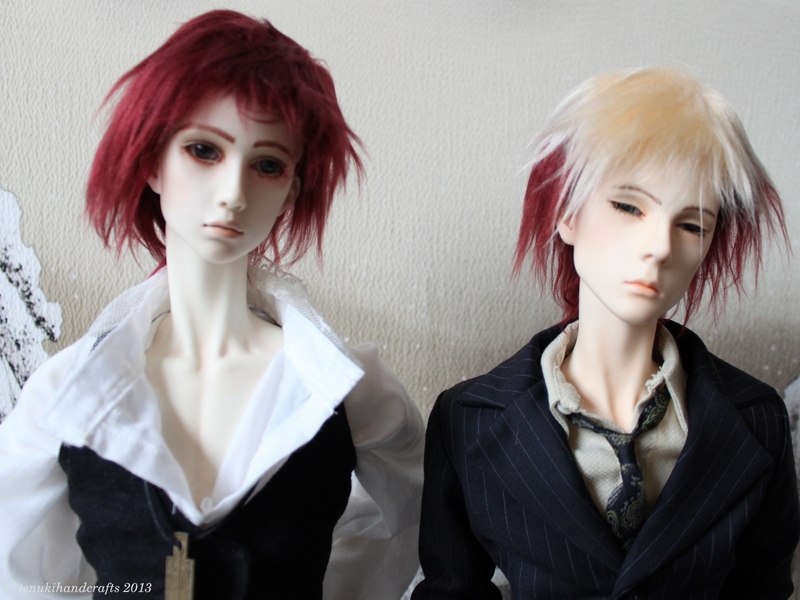 Here are few shots of the new Brick and his little brother, Tennyson. All photos were taken with my Canon Rebel and edited with Digikam. 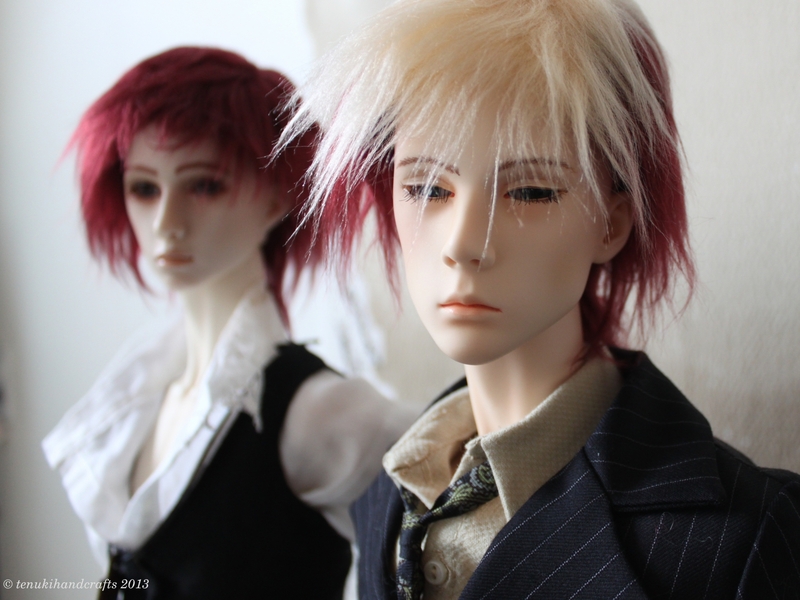 The Bernard has a lovely sad innocent look to him, and the Saint tends to look a bit cross or skeptical. Overall, I think the look of being related comes through, the wigs help. It’s a bit tough with the difference in skin tones. 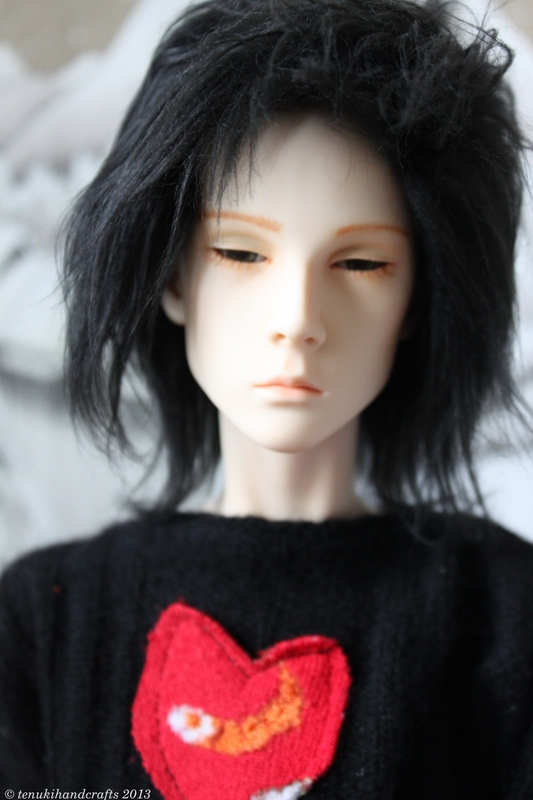 In terms of character in my cyberpunkish story, Tennyson is a Goth New Romantic, in order to maintain his pasty complexion. As a private eye, Brick gets out more, so he’s got a bit of color. How the brother relationship will play out in the story remains to be seen. After flipping through the photos, Brick is the older brother, who protects Tennyson from the Big,Bad World. Why is there a shrimp on my sweater?